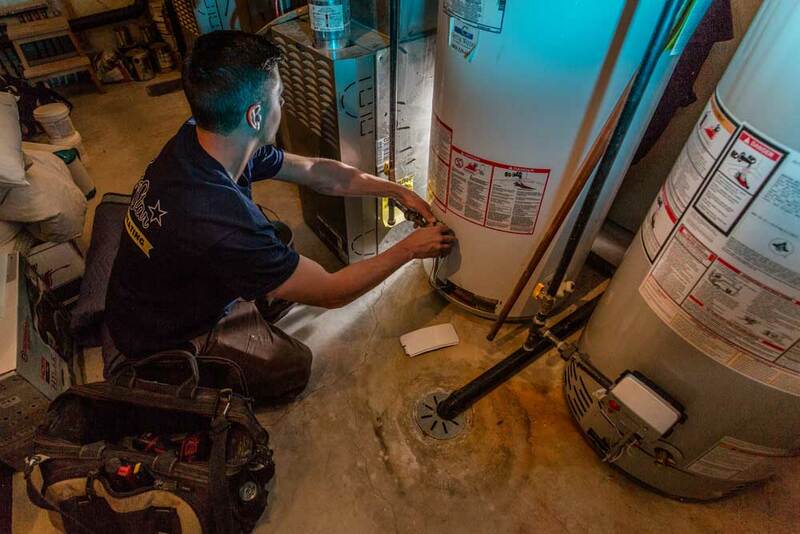 Whether you have a gas, electric or tankless water heater the licensed and experienced Calgary plumbers and gas fitters at Lone Star Plumbing can handle any repair you may need. A functioning hot water tank is essential for any home and when a problem occurs it can throw a wrench into your family’s routine. This is why whenever a problem happens with your hot water tank you need it fixed quickly and fixed right. Different issues can come up depending on the type of hot water tank you have, gas and electric water tanks can have varying issues. Gas hot water tanks can have problems such as pilot light issues, problems with the gas valve or something as dangerous as a gas leak. Electric hot water tanks can be faced with issues such as bad heating elements, faulty thermostats or a problem with the wiring. There are many problems that can face any hot water tank and most of the time diagnosing the problem takes a professional plumber and gas fitter. Let our licensed and experienced Calgary plumbers and gas fitters properly diagnose any problem that may be facing your hot water tank and fix it quickly and properly, so your family can get back to their everyday living. Has your current hot water tank become inefficient, out of date or broken past repair? Then it is probably time to have a new hot water tank installed. There are a number of things to consider when having a new hot water tank installed, such as removal of the existing water tank, whether or not you are going to switch the type of hot water tank you have, or if you require a different sized hot water tank. All of these factors will impact how your new hot water tank will be installed. 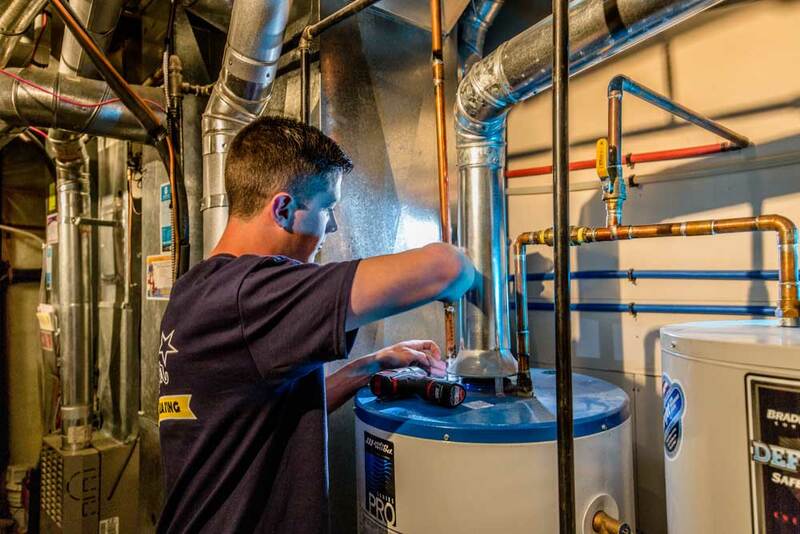 The Calgary plumbers and gas fitters at Lone Star Plumbing and heating know how to handle all the factors that go into installing a new hot water tank. Our licensed and professional plumbers can properly install your new water tank quickly and efficiently. Your hot water tank is leaking. Your hot water tank is not making hot water. Your hot water tank cannot make enough hot water for normal use. Water quality has dropped and calcium/debris are coming through the lines. The fittings on your tank are corroded. Are you living in a house where it seem like you are constantly running out of hot water? Then maybe it’s time to ensure you never take a cold shower again and upgrade to a tankless water heater. Tankless water heaters heat the water directly without the use of a storage tank. As a result, tankless water heaters deliver a constant supply of hot water. You never need to wait for a storage tank to fill up with enough hot water. Tankless water heaters also only heat water as it is needed meaning they save energy and will save you money. The Calgary plumbers and gas fitters at Lone Star Plumbing are experts at installing and maintaining tankless water heaters. If you are looking to make the switch to a tankless water heater let our licensed professionals get the job done right and quickly. The Calgary plumbers and gas fitters specialize in handling commercial hot water tank repairs and installations. We know that the needs of a business are different and you need your hot water tank running properly in order to serve your customers. Our plumbers are experienced in handling larger commercial hot water tanks and can fix any problem you may face quickly and professionally. If you require any commercial hot water tank repairs or need a commercial hot water tank installed then Lone Star Plumbing is ready to handle the job.